News from Haiti is BORING these days, isn't it? There is Haitian term "bouyon rechofe," it is when you are being fed the same information over and over again. I mean, really, how many times can I tell you, the Haitian senate will hold a national assembly, then turn around and tell you "ooops! sorry! no assembly," for the same reason, over and over, to decide on the fate of a president who is not even legitimately elected. I want to tell you a different story every day, something interesting, something what will make your day but, unfortunately, news like this is very hard to find in Haiti. So the next time you open your email box and you don't notice any news from us, don't panic, it most like means, there is nothing interesting out there that is worth your time. I wish to thank you from Brussels for your news and messages about Haiti. 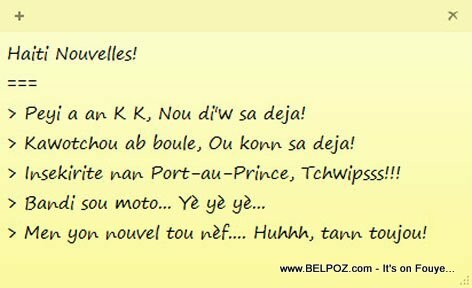 Specific information is essential and rare to get for who abroad is realy interested in Haiti Chérie, "La perle des Antilles"
Go on please, even it seems booring sometimes.